MCC is an Ecumenical Human Rights Church for all because God's love is unconditional and inclusive! God created you to be! TRANSFORMING OURSELVES AS WE TRANSFORM THE WORLD! Because we believe and we know that Jesus would never discriminate! Join The MCC Family. The Metropolitan Community Church (MCC) or otherwise known as the Universal Fellowship of Metropolitan Community Churches (UFMCC) was founded in 1968 by Rev. Troy Perry, a year before the New York Stonewall Riots. Some series of most unlikely events in Southern California resulted in the birth of the world's first church group with a primary, positive ministry to gays, lesbians, bisexual, and transgender persons. Those events - a failed relationship, an attempted suicide, a reconnection with God, an unexpected prophecy, and the birth of a dream - led to MCC's first worship service: a gathering of 12 people in Rev. Troy Perry's living room in Huntington Park, California. That first worship service in a Los Angeles suburb launched the international movement of Metropolitan Community Churches, which today has grown to over 43,000 members and adherents in almost 300 congregations in 22 countries. Over the years, MCC's prophetic witness has forever changed the face of Christianity and helped fuel the international struggle for LGBT rights and equality. The MCC has gained "observer" status in the World Council of Churches (WCC), fostering Ecumenism and Christian unity. It remains to be the biggest LGBT-led church in the world that continues to reach out to all LGBT and straight children of our Almighty Parent God. Founded in the interest of offering a church home to all who confess and believe in God's immeasurable love. MCC moves in the mainstream of Christianity of Catholic (Universal) and Protestant (Liberal) Christians. first independent worship service at Camp 7, Baguio City on Easter Sunday 2009. 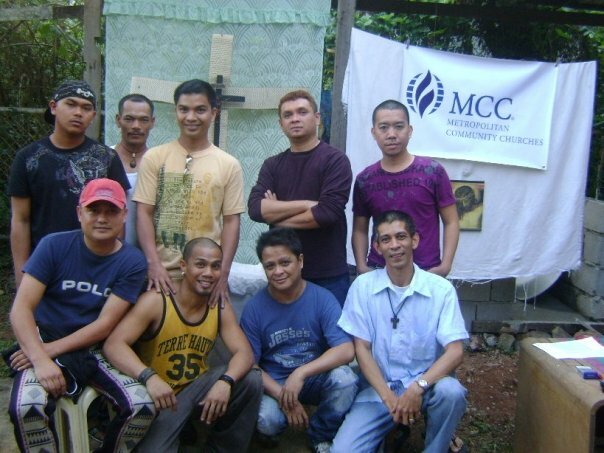 MCC PHILIPPINES is the first MCC in Asia, established in September 7, 1991. It was brought to the Philippines by Rev. Fr. Richard Mickley. 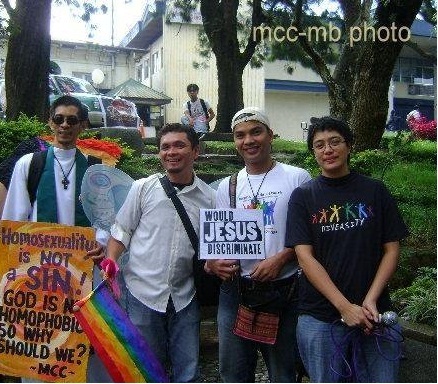 Together with PROGAY Philippines, MCC also led the 1st Philippine LGBT Pride March in Quezon City, that also became the first Pride Parade in Asia on June 1994. The organization aims to spread the vision of spreading God's love to the rest of our Asian lesbian, gay, bisexual and transgender brothers and sisters. Like all other Mcc churches in their ethnic origin, it is an ecumenical and inclusive fellowship for all and especially for the Filipino gays and lesbians. Since then, it has become a spiritual and social center for the local gays, lesbians, bisexual, and transgender communities through it's special outreach to homosexuals and sexually oriented minorities. In February 22, 2009, through the assistance of MCC Quezon City, the MCC in the Philippines yet made another huge step with the birth of MCC Metro Baguio when it held it's very first public worship service and induction of it's 4 founding members at the Ayuyang Bar in Baguio City. MCCMB continues to spread God's unconditional calling to all the LGBT communities in The city. The group is held strong by MCCMB's first Pastoral Leader Myke Sotero who has long been a steadfast advocate of LGBT rights. Today, MCC in the Philippines has 5 Philippine congregations and continue to expand, spreading the message of hope to all . We believe in One triune God, omnipotent, omnipresent and omniscient; of one substance and of three persons; God our Parent-Creator; Jesus Christ, the only begotten Son of God, God in flesh, human; and the Holy Spirit, God as our sustainer. We believe that Jesus, the Christ, historically recorded as living some 2000 years before this writing. We believe in Jesus Christ who is God incarnate, of human birth, fully God and fully human; and that being one with God, Jesus demonstrate once and forever that all people are likewise Children of God, being spiritually made in God’s image. We believe that the Holy Spirit is God, making known God’s love and interest to all people. The Holy Spirit is God, available to and working through all who are willing to place their welfare in God’s keeping. We believe that we are saved, from loneliness, despair and degradation through God’s gift of grace, as was declared by our Savior. Such grace is not earned , but is a pure gift from God of pure love. We further commend the community of the faithful to a life of prayer, to seek genuine forgiveness for unkind, thoughtless and unloving acts, and to a committed life of Christian service. We believe in the priesthood of all believers and that the church serves to bring all people to God through Christ. To this end, it shall arrange for regular services of worship. Prayer, interpretation of the Scriptures, and edification through the teaching and preaching of the Word, Amen. At MCC,we believe that even in our humanness, we are holy. We are liberated from other people’s definitions of who we are. We are made both body and spirit. We believe that our sexuality is a holy gift from God so we no longer distance our bodies from our experience with God. We are a people who proudly participate in the communion of body and spirit. At MCC, we believe that Jesus led the way in acts of compassion and acts of justice. Because we have been a people in the margins of society, we understand fully the grace that God has extended to us. We seek to distance ourselves from exclusion and draw ourselves closer to including all those who are marginalized in any way. We stand boldly with those who resist the structures of exclusion, as Jesus did, and work to insure freedom for all people. In the margins, we are blessed. At MCC, we come as we are to Christ and are changed by what we find. We experience a God with open arms, inviting all to take the sacred journey of faith and transformation. We are growing in our faith and claim that our place in society has magnified our place in God’s family. We are one of the many voices of God that, until now, has been lost in the margins! At MCC, we believe our ultimate ministry is in the world. We know that in order to prepare ourselves for radical service that changes lives, we must equip ourselves and others in the safety of a supportive community. We strive to live out a message that rejects the idea that any are excluded from the family of God. At MCC, we have experienced the soul destruction that comes from hate filled rhetoric. In restoring our souls, we have come to find that our voices will speak the liberation that comes through peace, compassion, love, respect and grace. As followers of Jesus, we believe ineveryone’s holy privilege to work out their own salvation. While we are a Christian church who follows Jesus, we respect those of other faith traditions and work together with them to free all those who are oppressed by hate, disregard and violence. Many have found a new meaning to their sexuality and realized it's inseparability from their spirituality. MCC's services have been availed of by Catholic priests, nuns, and Protestant pastors. 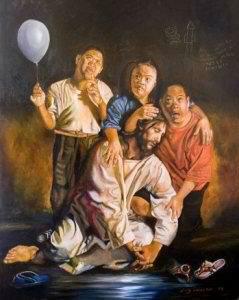 It has become a haven to all worshipers who have found a common bond in the Gospel of God's unconditional love. This is your safe haven where you are free to love and worship the way God created you to be. You are always welcome at MCC. The most beautiful word in the Gospel of Jesus Christ is "Whosoever". All of God's promises are intended for every human being. This includes gay men and lesbians. How tragic it is that the Christian Church has excluded and persecuted people who are homosexuals. We are all created with powerful needs for personal relationships. Our quality of life depends upon the love we share with others, whether family or friends, partners or peers. Yet lesbians and gay men facing hostility in society are often denied access to healthy relationships. Jesus Christ calls us to find ultimate meaning in life through a personal relationship with our creator. This important spiritual union can bring healing and strength to all of our human relationships. We firmly believe that God's love for all people is universal and unconditional. 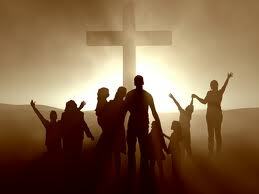 Now, more and more Christian churches and denominations are begining to open up their doors to welcome all. 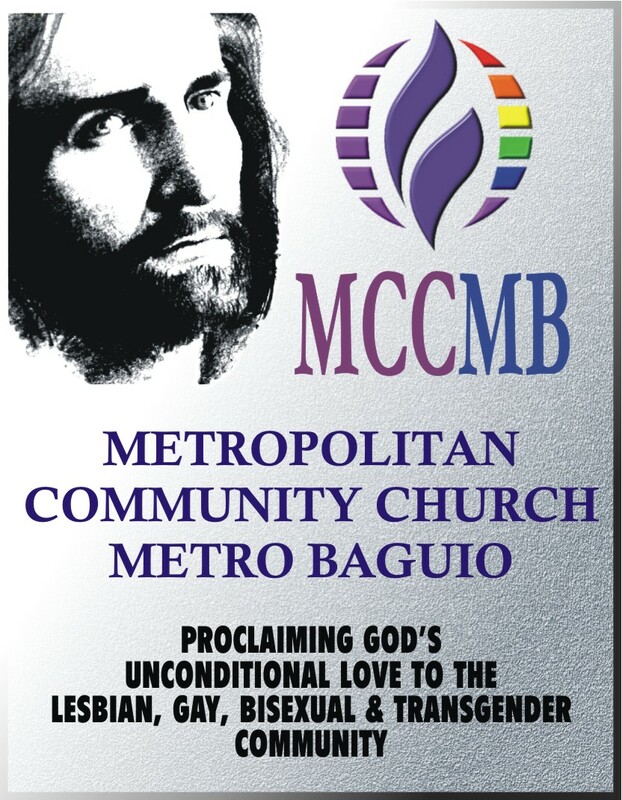 MCC Metro Baguio embraces everyone who believes that love binds us all to God who loves us the way He created us. Experience spirituality that celebrates your sexuality and holy identity without fear of discrimination and condemnation. Come as you are. Join the community of believers and proclaim to all that God LOVES us the way we are!